You are here: Home / ICI/PRO Community / Featured Instructor / Remarkable story that ends with her own cycling studio! Remarkable story that ends with her own cycling studio! When she was 13-years old, Casey was running near her home in Indian Hill when she was dragged into the woods and stabbed in the face, neck and side by her troubled 17-year-old neighbor, Benjamin White. Casey was able to fight him off. Physically, she healed rather quickly. Her emotional wounds would take a lot longer. “I couldn't sleep alone,” said Casey. “Couldn't be in the house alone, second floor alone… I remember the first night I came home and had to take a shower I had to have my mom in the bathroom sitting on the toilet because i was just too scared to be alone” “I probably slept in my parents room until I was 16,” said Casey. Diagnosed with severe PTSD, Casey has slowly made her way back with the support of her family and Children's Hospital's Trauma Department. 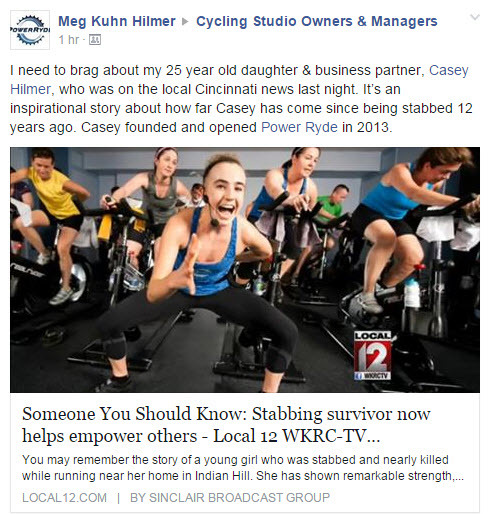 “There are highs and lows and new problems,” said Casey’s father Steve Hilmer. “You come home and the roof's fallen in and you rebuild the roof, but you keep going and there's no easy answer. You just don't quit.” “No matter what happens, you have to keep fighting,” said Casey. “You can't give up on yourself or your family. You have to fight for yourself.” Sports, like running, lacrosse, and indoor cycling, helped Casey to keep moving forward. After graduating from the University of Michigan and being turned down for medical school, Casey turned her passion for fitness into a career. “Sometimes you fail, and that helps you find what you're meant to do,” said Casey. “You have to keep an open mind and be persistent and the right thing will come to you.” Casey and her mom opened “Power Ryde” in Loveland. Casey motivates everyone in class with her enthusiasm and spirit. “I really try in 45 minutes to get people's minds off what's going on in their daily lives and make their day better in that 45 minutes,” said Casey.